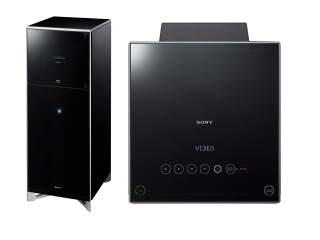 Sony today unveiled a fascinating new product called the HES-V1000 Home Entertainment Server. Incorporating an impressive 200 disc Blu-ray changer, it's designed to organise your collection of movies, CDs and photos in a standalone tower. As well as the full HD 1080p 200-disc Blu-ray Disc / DVD / CD changer, the server packs a 500GB hard drive. Sony says it will store up to 137 hours of standard-definition video, 40,000 songs or 20,000 digital photos. Additionally, the device is Sony's first Blu-ray Disc-capable component, other than its VAIO notebook or optical PC drive that can burn content to Blu-ray Discs, as well as DVDs. And if you were thinking that 200 DVDs or Blu-ray discs inside a home server would be hard to keep track of, never fear. Because if you connect the HES-V1000 to the internet, it'll download metadata for each disc and you'll be able to choose movies and CDs without having to remember which slot each is in. If you purchase the optional wireless adapter, you'll also be able to stream music around your home to other devices such as the Sony CPF-IX001 wireless music player, or any DLNA-compatible device. The feature-set is completed with a generous array of connection sockets including S-video, composite, audio and HDV/DV inputs, as well as HDMI with Bravia Theatre Sync, component, optical, coaxial and analogue outputs. "With its extraordinary storage capacity, the HES-V1000 unit is the perfect device to store and share personal digital content, such as high-definition home movies and photos," says Christopher Fawcett, vice president of home video marketing for Sony Electronics. "Not only can you burn photo slide shows and home movies directly to BD or DVD to share with friends and family, the device's massive storage capacity allows you to house an entire collection of movies, digital music and photos." The HES-V1000 Home Entertainment Server will be available in the US in October for about $3,500. That's around £1,700, although there's no word yet on whether the HES-V1000 will make it to UK shores at all.